San Francisco transportation can be a puzzle. The city seems bigger than it is, but it offers as many choices for getting around as there are items on a Chinatown lunch buffet. This guide was created with visitors in mind, to help you get around without frustration. If you know how San Francisco is laid out, it will help you find all the attractions easily. And make your San Francisco visit less stressful. Use our map to see where the major sights and areas are and to learn more about San Francisco transportation. San Francisco seems big to many people because they've heard about its many attractions. but it's actually a small city (49 square miles). And most of the tourist attractions are in a much smaller area than that. You can go from Union Square to Chinatown and North Beach to Fisherman's Wharf, all in about a mile and a half. Drive Yourself: The most laid-back people I know can get purple-faced, screaming angry when they have to find a parking spot in San Francisco. Avoid driving unless you have a good reason to. And think twice before renting a car. Parking is expensive, adding $40 or more to your hotel bill per night. The best way to get around is a combination of options. You can use the Google maps app to see which transit options to use for the trip you want to take. If you plan to use public San Francisco transportation often (buses, cable cars, trolley), you can save money if you buy a Muni Passport. They're available for 1, 3, and 7 days. If you're paying by the ride, the Muni transfer (which you get when you pay) is both a receipt and a re-ride ticket. Check its expiration time (where it's torn at the bottom) before paying again unnecessarily. Bus Tours: City Sightseeing double-decker buses stop at many of the most famous sights. Cable Car Charters' Motorized Cable Car Tours offer more stops and flexibility than others similar tours. The Go San Francisco Card offers transportation as well as a number of sights. Use this handy guide to find out all you need to know about it. Walk: Not only is it the best way to see the city up close, but it's also good exercise and inexpensive. Despite San Francisco's reputation for hills, the waterfront is perfectly flat, and most of Chinatown and North Beach are an easy walk, too. Combine that with a cable car ride up that hill ahead of you on Hyde or California, and you can get almost anywhere. Cable Cars: They go near most of the popular destinations, especially Union Square, Chinatown, Ghirardelli Square and Fisherman's Wharf, but the wait to get on can be long. Ride once for fun and then find another way to get around. The California Line takes you to the Ferry Building, Chinatown, and Nob Hill. All the details are in the Cable Car Guide. City Bus System: It's called SF Muni, and it goes everywhere, but it's crowded at rush hour and when school gets out. Use it to get to the Golden Gate Bridge, Golden Gate Park, and the beaches. Historic "F" Line Trolley: The Market Street Railway runs along Market Street and The Embarcadero from the Castro District to Fisherman's Wharf. 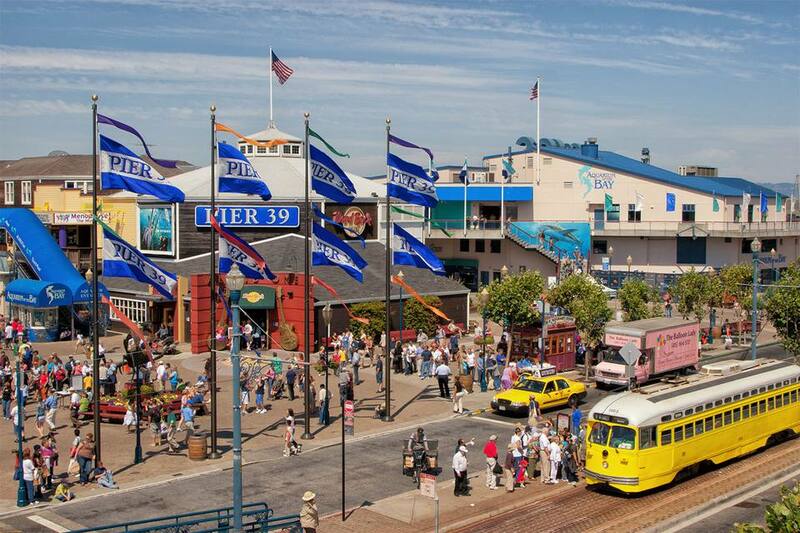 It's a good way to get to Fisherman's Wharf, the Ferry Building and Union Square. Their restored historic trolley cars come from all over the world. Taxis: A taxi may be a good option, especially if several people are traveling, but getting one can be a problem at peak times (in other words, when you really need one). Uber or Lyft may be a better choice if you use them. BART (Bay Area Rapid Transit): BART is a regional transportation system that covers much of the San Francisco Bay area. It's less useful than other options for getting around the tourist areas, but it does run to San Francisco Airport, Mission Dolores, and the Mission District. Here's How to Take BART from SFO to Downtown San Francisco. Alcatraz Cruises is the only one that actually goes to the island. The others just pass by it. For a trip out of town, rent a car for the days you need it only. Mobility-impaired travelers can rent accessible minivans with ramps or lifts, scooters and wheelchairs through Wheelchair Getaways. They'll pick you up at the airport when you arrive and drop you off when you're done, too.